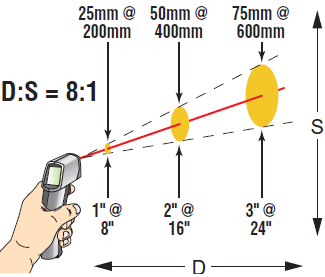 The optical system of an infrared thermometer "sees" the infrared energy of a circular spot. The spot should never be larger than the target, otherwise the thermometer will also see background objects, making the meassurement inaccurate. 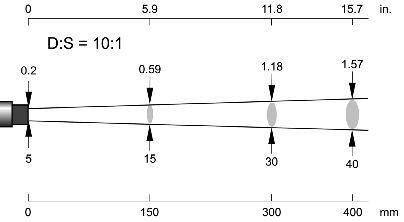 The spot size is directly propotional to distance, and the ratio is given as D:S for Distance-to-Spot ratio. As a rule of thumb, the quick way to get the approximate spot size, is to apply this ratio to the distance. For exact spot size, you can use Raytek's on-line spot size calculator. Just select model, enter distance and click on "calculate". Click here for the Raytek online spot size calculator.